Happy May Day to each of you! It was a busy weekend to close April in Wichita. Many of our members and friends participated in the many ICTArtDog events on April 29th. It was a great day for the ARTS in Wichita. With the help of the Wichita Community Foundation and the many sponsors, ArtDOG raised 1.14 million in just one day. Our own Chapter met it’s goal of raising $1000 for the Recital Fund. Way to go Wichita! 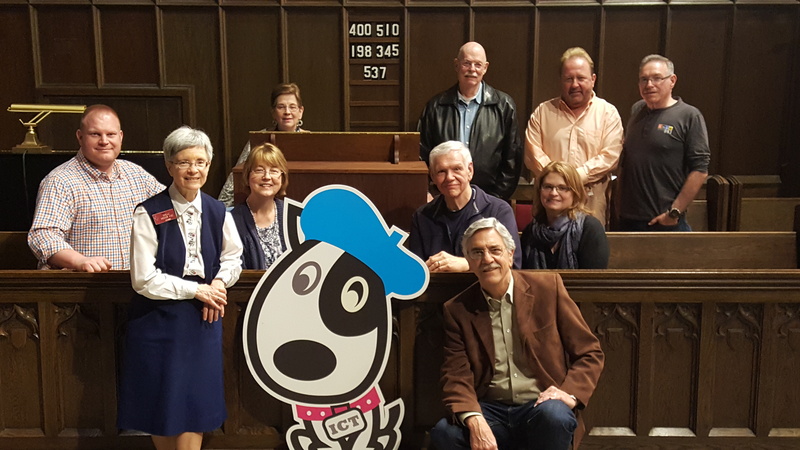 The Picture below captures a visit from “ArtDog” and participants at St. James Episcopal Church during our organ crawl. Over the next month, we will be holding our elections for the 2016-17 Executive Committee. We will be approving a new Dean, SubDean, and Class of 2018 member. In March, the Executive Board voted to reduce the number of representatives and to add a past-dean position. The previous model included the Dean, Sub Dean, Treasurer, Secretary, and three classes (two for each class). A total of 10 members. The new model will include the Dean, Sub Dean, Past Dean, Treasurer, Secretary, and three class (one from each class). This reduces the board to 8 members. Watch your email to find out how you can vote on the upcoming ballot over the next month. It’s time for membership renewal. Most of us received a reminder from national in our inboxes. Be sure to take care of this early. The portion of your membership that stays with the chapter is very important in program planning for the next year. Don’t hesitate to contact Chris or Gary for helping with membership renewal or any questions you might have regarding the OnCard system. As we close our program year, with just one event remaining in June, think about ways you can invite new members to join us for the upcoming year. Invite them to our End of Year event at Church of the Brethren. We will have the scholarship music library on display for purchases, a potluck meal, and an evening of games, fun, and fellowship. Put June 7th on your calendar now, more details to follow later!